Breakfast as we all know is the most important meal of the day. I have never been one of those people who could skip breakfast and survive the morning without it. Now that I have 3 more mouths to feed I find it more important to sustain their little bodies with as much goodness as possible. 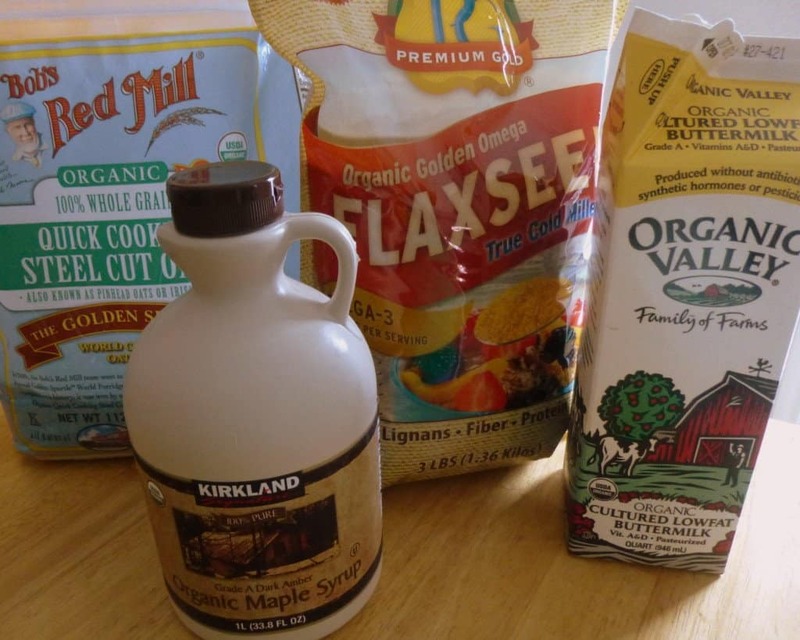 I do not believe in boxed pancake mix because it’s so full of additives and preservatives. I used premade mix for years till I realized how easy it was to make a batch of it myself ahead of time. These steel cut oat pancakes are actually easy enough to whip up without any sort of pre made mix. 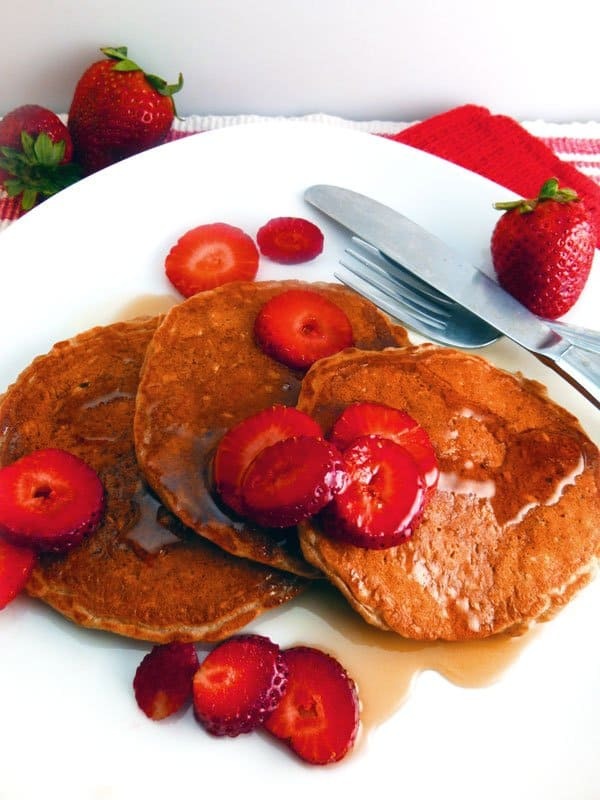 These steel cut oat pancakes go great with berries! I always serve them with either an assortment of berries or you can drop a few berries, fresh or frozen to the batter while cooking them to add some berry goodness. I often use frozen organic blueberries I get from Costco because they’re readily available in our house and a quick option to just drop right into the batter; couldn’t be simpler. 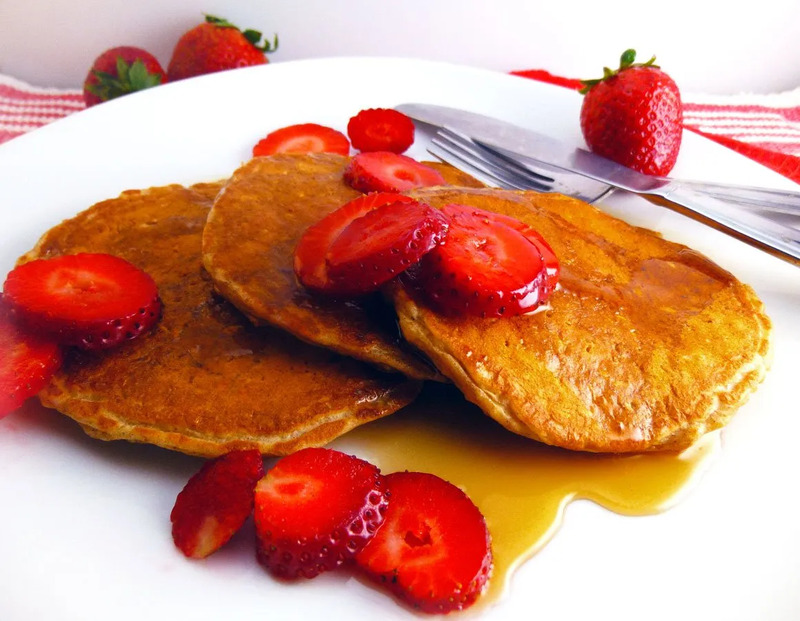 Either way, berries are so the way to go with these pancakes for a delicious balanced pancake breakfast. These are not your run of the mill pancakes so don’t expect them to cook like other pancakes. 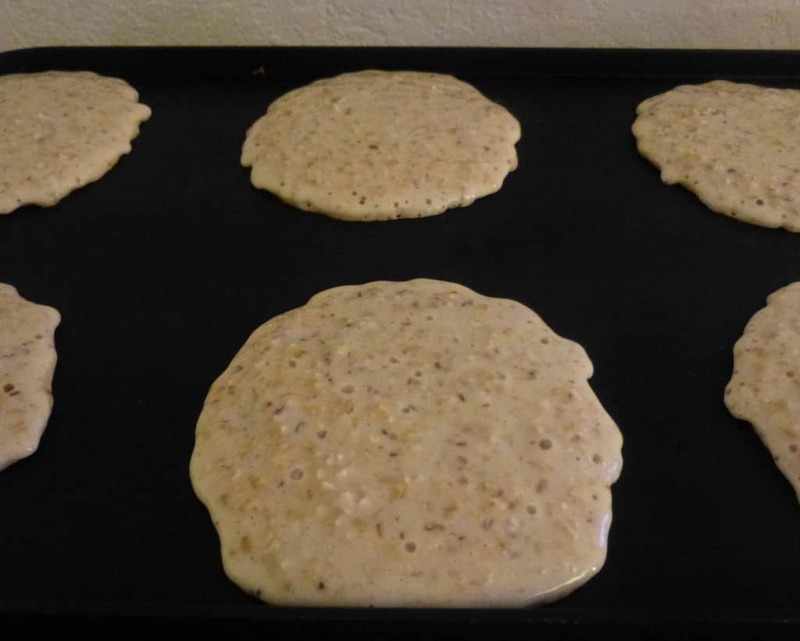 These pancakes bubble up they’re ready to flip, but you’ll only see a bubble or two closer to the edge of the steel cut oat pancake as shown below. Once flipped, just check the undersides till they’re a nice golden color like the 1st sides are. I make these steel cut oat pancakes on our trusty Electric Griddle since I’m usually making a pretty large batch but you could also make them in a pan if you prefer. Just like the cooking technique you’ll see texture for these steel cut oat pancakes is slightly different than traditional pancakes. These pancakes are slightly chewier because of the steel cut oatmeal. My kids eat these up with joy, but they might not be as exciting to those who are only used to eating fluffy starchy pancakes. These pancakes are delicious, filling and I know we’re getting a chock full of protein and fiber to keep us satisfied throughout the morning. If you make this big batch of steel cut oat pancakes and they’re not all eaten up just freeze them. When you’re ready to serve them just pop them in the toaster frozen on a medium high setting and voila…they’re ready to serve and eat! Quick, easy and satisfying breakfast without chemicals and processed garbage like pre-made frozen store bought pancakes. 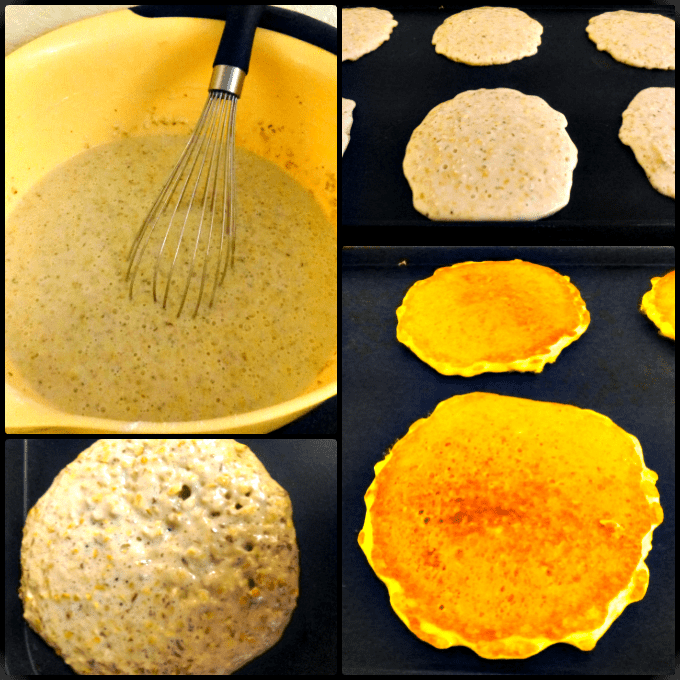 Give these steel cut oat pancakes a try and let us know what how you like them! While Oats soak measure out the dry ingredients, flour through salt into a large mixing bowl and stir to combine. Once the oats are done soaking add the buttermilk through vanilla extract to the soaking oats bowl. Stir well to combine. Now add the wet ingredients to the dry ingredients bowl, stir to combine til there are no more large flour clumps visible. *Optional- you can drop 4-5 blueberries or other small berries onto the batter at this point if you like. Add fresh or frozen blueberries to batter or just serve these with fresh fruit and real maple syrup. My name is Katia (pronounced Kah-tsyuh). I'm passionate about my family, real food and I love learning more everyday about food and living a more well rounded, whole life. I love cooking really good food, eating it and trying new things. I strive for sharing quality versus quantity in regards to my posts. I believe with a good balance in food as with life, you can enjoy all the things you love without sacrificing your health and enjoyment of the better things in life. All in moderation. I'd love to inspire others to try cooking with real ingredients, I mean real food instead of prepackaged processed food. Give the site a peek, try some recipes and feel free to share your thoughts. The texture is slightly different? Well, that's an understatement. I made these 100% according to the recipe. the texture was rather chewey and downrigh tough for a pancake. Maybe it's because I'm used to making pancakes with white flour with basically the same other ingrediants as these. But, the steel cut oats and whole wheat flour add a balance of nutrition and gut cleansing. I will attempt to alter these ingredients to make a more palatable cake. Since I can purchase 50 pounds of organic steel cut oats from my company for less than $50, and they are rather healthy, I'm a fan! Mike, You're right. They are a bit chewy, but I wouldn't say mine turn out tough. I have found that making them with different steel cut oats makes a difference as well. It must be the difference in how they're milled. I used one type once and they were very tough; I honestly don't remember the name now. Like you said they are great for the gut so the fact that my kids eat them is a big deal to me. I hope you can adjust them more to your liking. You can try making them with all unbleached flour also if that helps you. Thanks for the comment. Hi Katia how was wandering if I can use rice flour or almond’s or amaranth’s for this recipe because I am in a gluten free diet. Thank you in advance for your advice! Hi Aurora. Thanks for the question. Because you asked I just made them this morning substituting all flour for almond meal (that was the only gluten free alternative I had on hand), still adding the ground flax seed and adding the optional frozen berries (blueberries in my case). The pancakes' consistency turns out a bit different because the batter is much runnier. I suggest adding 1/4 cup less milk and about 1/4 cup more gluten free flour. Also, I suggest making them on a griddle because they are much more delicate this way and the griddle gives you an easier surface to work with with gently flipping the pancakes. Taste-wise they turned out tasting about the same so my boys and I still enjoyed them. Hope this helps. Let me know how they turn out for you.